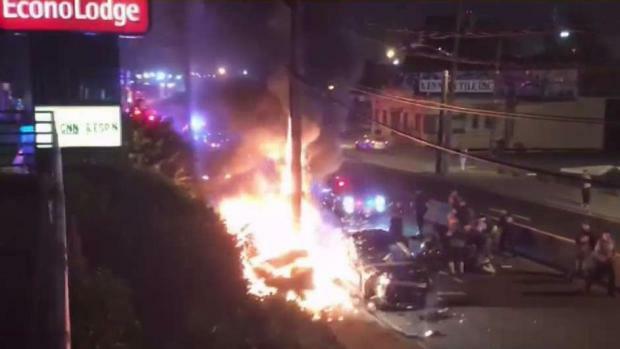 A police chase ended in gunfire and a fiery crash in New Jersey Sunday night, authorities and witnesses say. Wale Aliyu reports. A police chase ended in gunfire and a fiery crash in New Jersey Sunday night, authorities and witnesses say. Authorities say police officers tried to stop the vehicle near Ocean and Cator avenues in Jersey City shortly after 11 p.m. Sunday, but the driver fled. Officers gave chase, pursuing him down Tonnelle Avenue. The driver got into a minor crash as he tried to move between two lanes of traffic, authorities say, and Jersey City police opened fire. It wasn't clear if anyone was hit by the bullets. The suspect kept going -- until he crashed into a utility pole a few blocks away and his vehicle burst into flames. A man who happened to be driving along Tonnelle Avenue at the time of the chase was critically injured when the suspect's vehicle combusted, authorities say. The victim is being treated at a hospital for severe burns to the body, but he is expected to survive, authorities say. 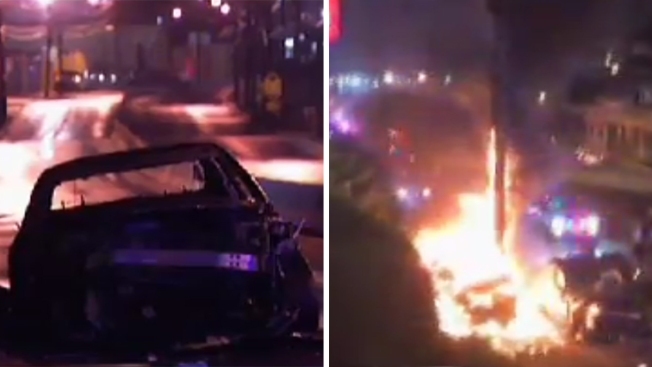 A police chase in Jersey City ended in a fiery crash, police say. Tracie Strahan reports. The driver of the fleeing vehicle, identified as 48-year-old Leo Pinkston, of Jersey City, was also injured. He is being treated at a hospital and faces charges of aggravated assault and eluding. Prosecutors didn't immediately say why police initially tried to stop him, nor did they say why he may have fled. Meanwhile, parts of Tonnelle Avenue were closed for hours as authorities investigated. Tom Evans watched the scene from his balcony and described the frenzy that unfolded right below him. Evans said he saw emergency responders struggle to pull someone out of a burning car. He also said shots rang out at one point, but it wasn't immediately clear whether cops or the suspects fired them. Video from the scene shows at least three damaged police cars and two other charred vehicles being towed away from the scene.